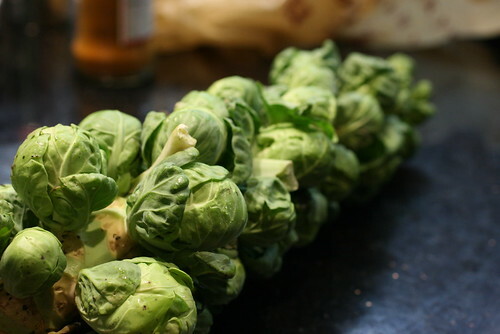 Right now, brussels sprouts can be found in the farmer’s market, on the stalk, a signal of freshness. I like smaller ones, around 1″ in diameter but the larger ones are just as good, but you do have to halve them to ensure even cooking. 1. Preheat oven to 400 degrees F (375 degrees F with convection). 2. Put the beets in a tupperware container with lid and microwave on high for 2 minutes. Remove from the microwave and let it rest for 2 minutes. Turn the beets over and re-cap the tupperware and microwave for another 2 minutes. Let it rest for 2 minutes and check that a small knife pierces easily. If it’s done, just let it cool. If not, microwave for another minute. 2. While beets are cooling, bring salted water to a boil in a 4 quart pot. Boil brussels sprouts for 4 minutes. Drain and rinse with cold water. Set aside. 4. Heat bacon in a large cast iron pan over medium high heat and stir around for about 2 minutes. 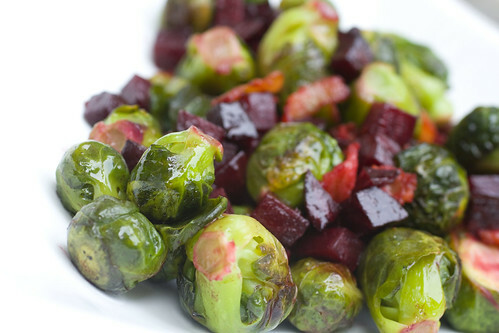 Add brussels sprouts and beets. Season to taste and stir for the fat to coat, about 2 minutes, then place in the oven for 5-7 minutes, or until browned nicely. Serve immediately. posted by jessica	at 08:30 PM	Filed under American, Recipes. You can follow any responses to this entry through the RSS 2.0 feed. Both comments and pings are currently closed. 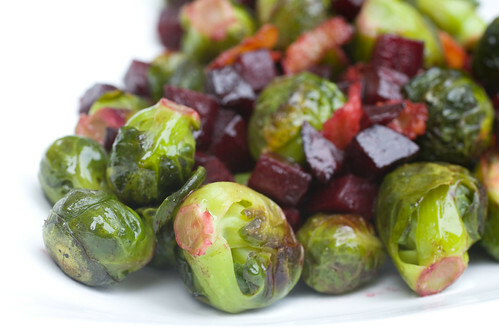 Not a big fan of b sprouts as a rule but this dish might be enough to change my mind…. Snazz, is bacon enough to win you over? but not with beets. However, I'm giving it a thumbs up,('cause I love all the ingredients) and although we don't have a Thanksgiving Day here, I'm thinking Christmas Day! lesley, I was thinking that too because of the great colors. That may be the dish that changes Vinnie’s mind @ brussel sprouts. Yumm! Kristine, bacon usually helps win over the boys. Brussel sprouts are one of my favorite vegetables to roast. I like the idea of throwing bacon and beets into the mix. Muddywaters, yay! another one for brussels sprouts! My family tried this recipe last night it was a smash hit. Number 1 with a bullet. Normally, in our household, the three b’s consist of beer, bacon, and beans. It was nice to switch it up a bit. I especially liked the idea of cooking the beets in the microwave. It saved some time and energy. Well done. Thanks Muddywaters! I’m so happy you all enjoyed it! Seriously, you have justified my existence! BTW, I’s gonna try your three B’s too.